For outstanding heroism in the field (despite himself), computational demonologist Bob Howard is on the fast track for promotion to management within the Laundry, the supersecret British government agency tasked with defending the realm from occult threats. Assigned to External Assets, Bob discovers the company (unofficially) employs freelance agents to deal with sensitive situations that may embarrass Queen and Country. So when Ray Schiller—an American televangelist with the uncanny ability to miraculously heal the ill—becomes uncomfortably close to the Prime Minister, External Assets dispatches the brilliant, beautiful, and entirely unpredictable Persephone Hazard to infiltrate the Golden Promise Ministries and discover why the preacher is so interested in British politics. And it’s Bob’s job to make sure Persephone doesn’t cause an international incident. If you like Stross's "Laundry" books you will love this one. This review was first published on Kurt's Frontier. Winner of the 2013 Locus Fantasy Award. Synopsis: Bob Howard is, for outstanding heroism in the field, being fast-tracked for a managerial promotion within Laundry. Laundry is a super-secret British government agency that defends the UK from occult threats. As part of his review, he is assigned to External Assets. His first task is to investigate Ray Schiller. Mr. Schiller is an American TV evangelist who has become uncomfortably close to the Prime Minister. 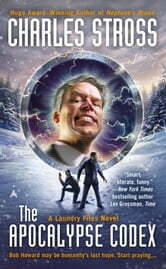 Bob finds himself teamed up with freelance agents Persephone Hazard and Johnny McTavish and sent to Colorado. Their mission is to determine if the reverend is in anyway going to prove to be an embarrassment to the PM’s government. Bob, Persephone, and John get more than the bargain for. Schiller’s Golden Promise Ministries is attempting to wake a Lovecraftian horror, believing he is bringing about the Second Coming. The trio must evade various creatures that are trying to get into their bodies and take them over. They must also contend with their American counter parts who can’t get into Colorado and are extremely annoyed. They must find a way to stop the Sleeper from being awakened. Review: Charles Stross has written a mixture of urban fantasy, cosmic horror, and spy thriller. We are introduced to Bob Howard, a computational demonologist; Persephone Hazard, a witch; and John McTavis, Ms. Hazards ex-military assistant. This is the fourth book in the Laundry series. 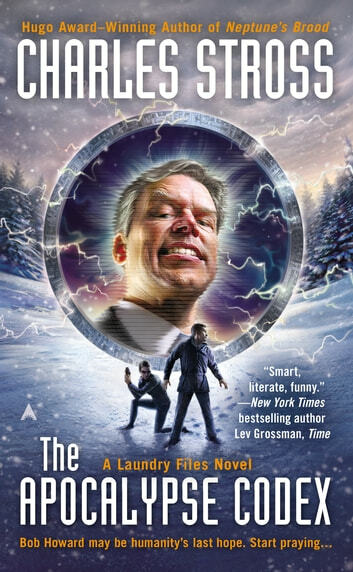 When investigating if TV evangelist Ray Schillers relationship with the Prime Minister, the three have to use a mixture of high-tech devices, magic, and skill to stop the Sleeper, who is something like Cthulhu. At first blush, The Apocalypse Codex seems like a story should be a page-turner. I started reading the book at the beginning of November and finally finished in December. It was difficult to get into. I’d put it down, and it would take weeks to get back to it. The idea for the story is intriguing. A British secret agency dedicated to protecting against occult threats. The story had a slow start. Once Bob Howard reached America, the action and cloak-and-dagger started up. Even then it was didn’t do much to hold my interest. I found it hard to make sense of this lack of interest since the ideas were interesting and intriguing. I believe it is (at least in part) because the descriptions Charles Stross gave were so hard to imagine. He had a hard time getting me to visualize the obviously interesting action.